Located at a Harley Davidson dealership. 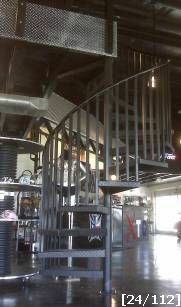 An all aluminum spiral stair with a "mill" finish. Mill finish is a term used to describe material that is unfinished or the way it is received from the mill. This dealership used aluminum throughout the showroom floor, and this stair fit right in. Aluminum spiral stairs are used more often in exterior application for corrosion resistance. On most applications (other than near the coast) a mill finished aluminum spiral stair will perform fine. On the coast a coating should be considered. Stairways Inc can apply a painted finish, epoxy, or powder coating. Contact our sales staff for more information.